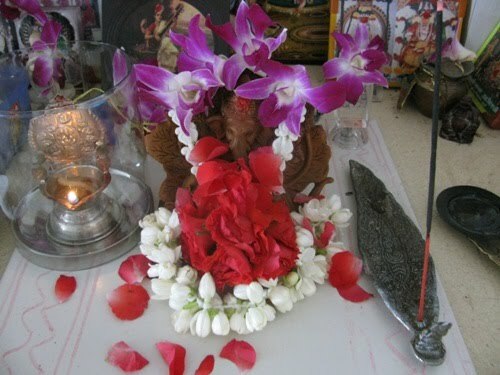 Wishing you all Happy Vinayagar/Ganesha Chathurthi. 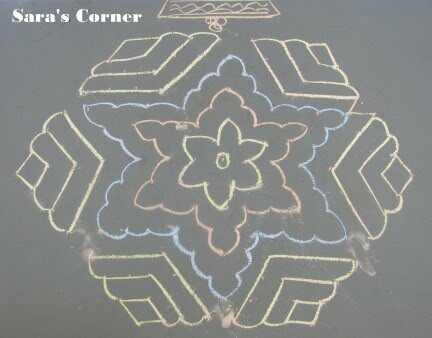 My day started with this Kolam/Rangoli. Vinayagar Chathurthi falls on 11th Sept 2010. It is celebrated in many parts of India but in specific celebrated very grand in Maharashtra. Big idols are kept by the sides of the streets and celebrated for 11 days or even upto a month. Music and dance performances takes place every day during this period at the end of which these idols are taken to the sea and immersed in water. At home it is done on the same day or on the third day. People with small and medium idols. People with small and medium idols immerse it at home in a bucket of water or in the tank. Some people take to nearest lake and immerse. 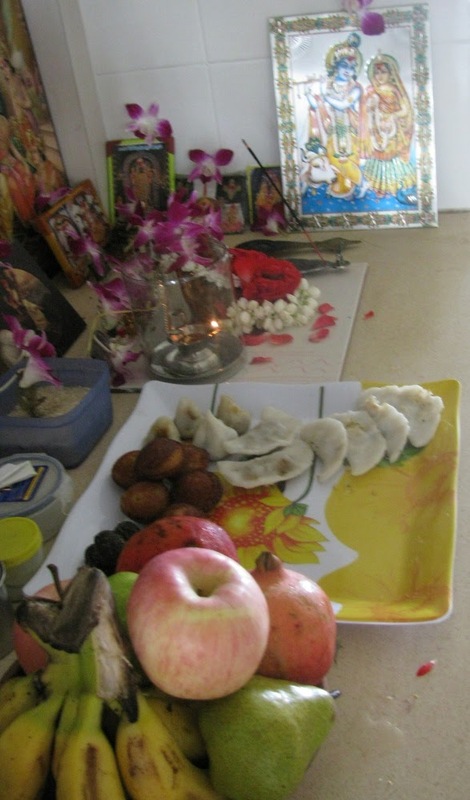 Back home we decorate the table for ganesha with lots of colour paper, banana leaves, fruits, lighting, Mango leaves, etc.. Ganesha is placed in a silver plate filled with rice and money. Garlands specially handmade in cotton(Gejje Vastra). You also get garlands made of lotus and chickpeas. People visit temples and friends. Children take Akshata(Rice mixed with turmeric and water or ghee) and visit as many houses to see different kinds of idols and puja. 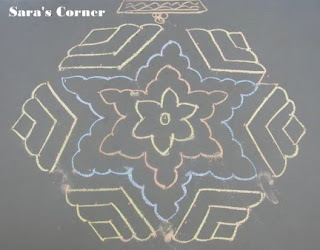 Also enjoy the prasadams.In Karnataka, they also celebrate Gowri Festival one day before Ganesha Festival. They worship the idol of Goddess Gowri mother of Lord Ganesha. Its called Gowri Ganesha Habba. Plain Clay idols or colour idols are available. Hope this festival gives good health, peace, wealth and prosperity to everyone.Kozhakattai/Modak is favourite of Lord Ganesha and is an important dish on the menu for the Festival. Delicious Dishes prepared on this festival without onion and garlic by Brahmins/Iyer. Click on the names for recipes. For step by step recipe of Poornam and Ullandhu Kozhakattai click here. Sara Happy Ganesh chaturthi to You and your family..Pic are divine,Love the rangoli..
Nice post dear with excellent clicks...! Very beautiful post..thanks a lot for sharing with us..